RJ’s back…and he’s having trouble again! This entertaining story follows RJ as he goes about his day doing the things he enjoys, but when a couple of friends give him compliments, he just isn’t sure how to respond! As RJ continues through the day, he hears from his teacher and parents that while there are many things he’s doing very well, there are also some things he needs to work on. His first reaction is to argue and make excuses. Throughout this must-read story, RJ learns what it means to receive positive and negative feedback, and how to respond appropriately to that feedback. 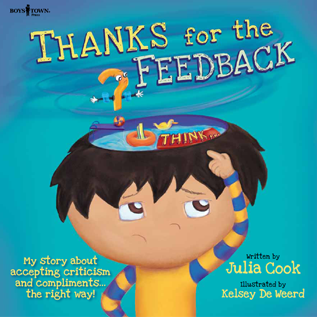 Parents and teachers will love taking kids on RJ’s journey as he discovers feedback’s many forms, and learns to accept and grow from criticism and compliments at home, school and with friends. Thanks for the Feedback (I Think) is the another in the very successful Best Me I Can Be series from Boys Town Press.